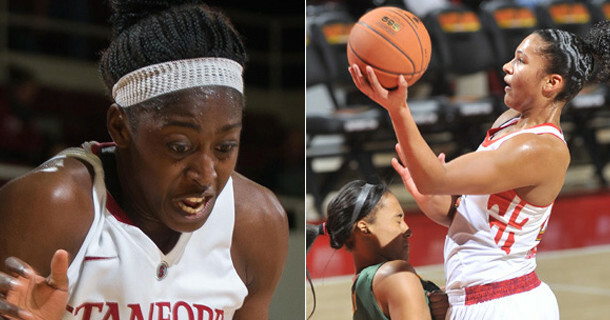 Home / Updates / 2014 WNBA guests reported: 12 prospects invited to Monday’s draft. Natalie Achonwa Notre Dame Post 6'3"
Stefanie Dolson Connecticut Post 6'5"
Markeisha Gatling N.C. State Post 6'5"
Chelsea Gray Duke PG 5'11"
Bria Hartley Connecticut G 5'8"
Natasha Howard Florida State Post 6'3"
Kayla McBride Notre Dame G 5'11"
Chiney Ogwumike Stanford Post 6'4"
Shoni Schimmel Louisville G 5'9"
Meighan Simmons Tennessee G 5'9"
Odyssey Sims Baylor G 5'8"
Alyssa Thomas Maryland F 6'2"
As some of you WNBA fans probably remember, the list of attendees isn’t necessarily the list of first round picks: last season, Penn State’s Alex Bentley was drafted 13th after uninvited A’dia Mathies was selected by the L.A. Sparks in the first round. Back in 2012, attendees Tiffany Hayes, Kayla Standish, Riquna Williams, and Julie Wojta went in the second round, Vicki Baugh and Lynetta Kizer went in the third round, and LaSondra Barrett was one of four attendees who didn’t even make an opening day roster. Based on our mock draft, this year’s list certainly seems more likely to be as solid as the 2013 list rather than 2012’s. There are no major “snubs” here, but two additional players who might be worth keeping an eye on – whether in the first round or later – might be Oklahoma State point guard Tiffany Bias and Georgia Tech wing Tyaunna Marshall.